Fall seems in the air this morning, it's windy and cool. Yet, it still feels summery because the wind is very fresh due to last night's rain. Sunset Lightning Storm from S@sha on Vimeo. This sunset drove me to pause the movie I was watching to go outside. (I was watching The Ghost Writer. Have you seen it? Ewan McGregor and a spectacularly rainy Martha's Vineyard modernist beach house make it worth watching). 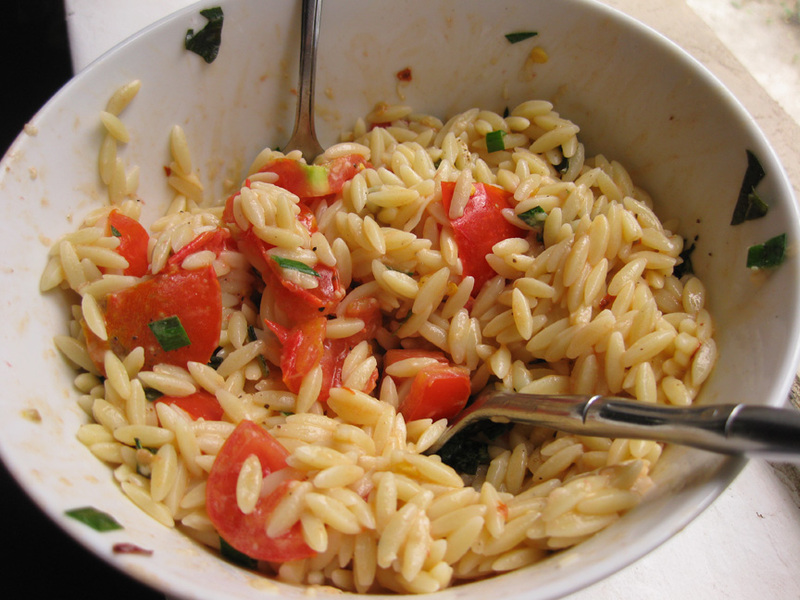 Orzo, fresh tomatoes, basil, garlic chives and a little asiago and mascarpone for creaminess. Perhaps due to all the rain last night both here and on my television screen, I needed comfort food for lunch. This simple pasta dish sufficed.